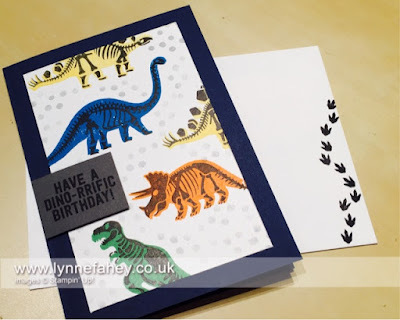 Stampin Up Demonstrator - Lynne Fahey (Spiralz and Curlz): Card made using "No Bones about it" stamp set from Stampin' Up! Card made using "No Bones about it" stamp set from Stampin' Up! Well Hello! it's Monday and as promised here is the final card made at my August card class. It's made using a stamp set called "No Bones about it"... what a fun set, and it can be used for all ages! When I asked the ladies what their favourite card was from the three they'd made it took them a while to decide.... the final vote was they loved all three equally and said they'd make them all again, what a result! I love holding my classes. We have such a fun time and everyone tells me they learn so many new tips and techniques. 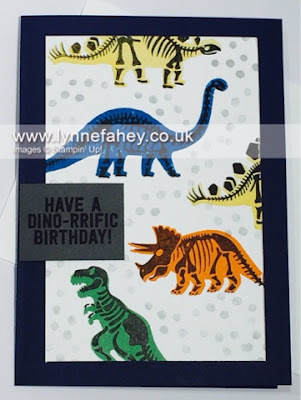 Come and have a look at the final card, its bright and so easy to recreate, honest! I would love to hear what you think of today's card so please leave me a comment, and as usual, if you would like to order any of these products just click on the scrolling pictures and it will take you directly to my online shop that's open 24/7. Or you can email me your order and I will happily place it for you. I'll be back tomorrow, yes I know it's Tuesday, but the BRAND NEW Autumn/Winter catalogue comes out tomorrow so I'll be sharing it online!!! If anyone would like a copy, please message me and I'll got one sent out to you.